The largest and most widely distributed of all Indian deer, the Sambar is the ubiquitous presence of the jungles of the sub-continent and of south-east Asia. As such it could be considered to be the mainstay for the Tiger for it was in the wake of the radiation of such large cervids that tigers colonised much of their present range. It can fairly be said that where Sambar and Tiger ranges are co-terminus, this is the preferred prey species simply because its large size makes the hunt more cost-effective for the Tiger. This does not necessarily mean that they make up the bulk of Tiger prey in numbers or weight simply because they may not be as numerous as other prey species but that they form a disproportionately high percentage. Generally dark brown in colour, both the stag and hinds sport a ruff of hair around the neck, though this is more prominent in large stags. The winter coat is general darker in colour and when the animal is moulting in April/May, the tufts of old hair still unshed, gives the sambar a very unkempt appearance. They support an impressive rack of antlers with a thick main beam that forks out towards the tip and a brow tine. Old hunting lore records antlers of over 50 inches (127 cm) in length but in general they are between 20 to 30 inches (50 to 75cm) long. In some parts of India, especially in Assam and in Southern India, Sambar have a 'sore patch' below the throat. The reason for this is unclear. Adult Sambar stags in full antler are a majestic sight and indeed these deer impart their own particular excitement to the jungle. For all their great size, they are remarkably silent and in dense hilly country can be surprisingly elusive. Yet, when they detect a predator they give voice in no uncertain manner which, in the words of the well-known naturalist M.Krishnan is (a) "
reach their best size of body and antler in India, particularly in central India. The Sambar is the most widely distributed of all the deer in South Asia and is found in a variety of habitats; from around 10.000feet in the Himlayan foothills, to the uplands of Central India. They range from the wet forests of the North East to the arid thorn scrub of Gujarat and Rajasthan. Sambar are present throughout Peninsular India including the wet evergreen forests of the Western Ghats, and are also found in Sri Lanka. Its range extends across south-east Asia. 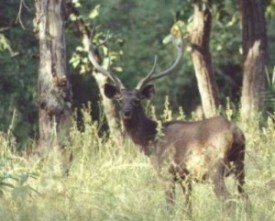 The Sambar are forest deer and unlike Chital, they are not herd (gregarious) animals. Through most of the year individuals or small groups of 3-5 animals may be seen. A familiar three, a hind accompanied by a fawn and a yearling from the previous season's breeding is quite a normal sight. Large concentrations occur during the summer when groups of 9-12 may be seen, often in meadows as browse in the woodlands becomes scarce. Older stags tend to be solitary outside of the mating season. Being forest animals, Sambar are primarily browsers and are known to eat small twigs and bark. Sambar do not associate as noticeably with Langur (Semnopithecus entellus) as do the Chital. But they do not shun the offerings provided by the monkeys especially when these comprise such prize items as Mahua (Madhuca indica) flower and fruit. They also graze on grass and appear to have a particular fondness for aquatic vegetation which they consume in large quantities wherever available, spending extended periods partially submerged. This is best seen in places like Ranthambhore and Keoladeo Ghana National Parks and one of the most memorable wildlife action moments on film is the explosive scene of a Tiger chasing Sambar through deep water in Ranthambhore.in this manner.It has been suggested that the reason for their wide distribution is their ability to effectively utilise different habitats. Sambar love to wallow. Dunbar Brander reports seeing groups of Sambar submerged in water on frosty mornings in central India simply to keep warm since the water temperature is always higher in the mornings than ambient temperature. They also use mud wallows and one reason could be to use the caked mud as a defence against biting insects. The rutting season of sambar also varies considerably. Stags shed their antlers before the monsoon and by early winter most begin to rub off the velvet. At this time a number of trees are adorned with a 'blaze' where the bark has been scraped off. Rut peaks in the cold weather and spring and is preceded by sparring matches that can sometimes lead to fierce, even fatal, battles. Facial glands also become enlarged and prominent at this time. Unlike other deer sambar make no audible rutting call but stags indulge in considerable displaced aggression and can often be seen strutting about with clumps of vegetation streaming from their antlers. The gestation period is between 7 & 8 months with one, occasionally two, young being born. 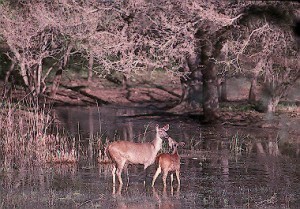 Females generally bear young once a year and a single fawn (occasionally two) is produced.